[prMac.com] Prague, Czech Republic - Bohemia Touch today is proud to announce the release of Shire Defense 1.0 for iPhone, iPad, and iPod touch. Shire Defense is a challenging fantasy tower defense game set in the wonderful world of magic. The kingdom is at war! Players battle to defend their shire from the oncoming hordes of zombies, wizards, warriors, mages and hobbit ogres. Strategically place defenses made up of wind tornadoes, fireballs, tornadoes, poison clouds, and metal bees, in a desperate struggle to defend the shire to the death! Players will find themselves defending different regions of their kingdom, waging war across 25 unique maps that include such challenging environments as forests, mountain passes, shires, and towns. As they battle, defenders will be faced with challenges of ever increasing difficulty, each leveling up as their skills continue to increase. In the face of 5 different types of enemies, players will need to strategically use the 5 varieties of defenders available in their arsenal to defend their shire from the continually advancing enemies. Making use of Ploppers, Twisters, Hives, Fireballs, and Mortars, warriors must use all available defenders to protect their land. "While many players are familiar with the usual tower defense type of games, in Shire Defense we wanted to offer them a challenge with a twist," says Roman Knize, owner of Prague based Bohemia Touch s.r.o. "With the added levels of challenges, as well as the ability to upgrade defenses as players face ever increasing attack hordes, Shire Defense brings something new to the gaming table that will bring players back, ready for new challenges every time they play the game." While Shire Defense will prove an entertaining challenge to players of all skill levels, beginners will appreciate the game's easy-to-use touch-based interface. Players simply tap the screen to select a spot to place a defensive weapon, and then tap again to select the desired defender. The game assists new players, instructing them as to how they can properly defend their shire from the oncoming attackers. Quick reactions and thinking are required for this game, and proper placement of defenders is paramount to destroying all the enemy invaders. A smart strategy is the ultimate weapon in Shire Defense, as simply placing defenses in random locations will not result in victory. Players need to strategically place their defenses where they can do the most damage, using some defenses to slow down the ever-advancing hordes; allowing other types of defenses enough time to efficiently wipe their enemies from the face of the earth! A close eye should be kept on the defenses, as they will need to be periodically repaired or upgraded in the heat of battle. More advanced players will welcome the ability to upgrade their defenders as the challenges increase in later levels. By using their gems wisely, warriors can select the correct defender to destroy oncoming hordes. 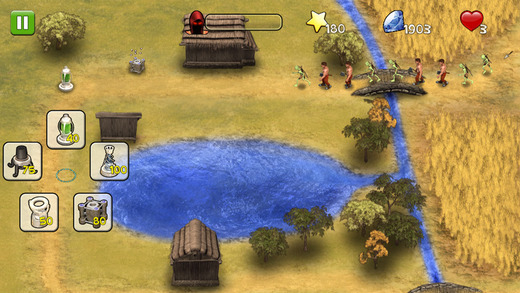 A wise player will carefully, yet quickly, place upgraded defenses in strategic spots to wipeout the attackers before they can destroy their defenses. Placement of these objects is all important, especially in later levels, as the the hordes grow increasingly large and aggressive. The 5 different kinds of enemies add to the challenge; as different attackers require new strategies to properly defeat them. While in-app purchases are not required to play Shire Defense, the game offers a number of Gem packs to speed up the player's progress by upgrading their defense capabilities, including improved Ploppers, Twisters, Hives, Fireballs, and Mortars. These upgrades making it easier to destroy the enemies before they destroy the defenders. Players can also use gems to unlock the various available maps for faster progress. Shire Defense 1.0 is free, and is available worldwide exclusively through the App Store in the Games category. In-app purchases are available, containing four different gems packs which help to speed up progress in the game by upgrading defenders, and making new maps available for use. Bohemia Touch is a mobile software development studio founded in 2009, and based in Prague, Czech Republic. The company aims to provide iPhone, iPad and iPod touch users worldwide with sophisticated applications that are easy to use, entertaining and unique in design. Bohemia Touch is made up of a team of a highly creative and enthusiastic people who strive to develop products of the best quality and face the challenge of the ever changing mobile industry where only the sky is the limit. Copyright (C) 2015 Bohemia Touch s.r.o. All Rights Reserved. Apple, the Apple logo, iPhone, iPad and iPod are registered trademarks of Apple Inc. in the U.S. and/or other countries.